E-mail address Password Forgot your password? There is no other track as perfect as Monza when it comes to driving our powerful and luxurious cars at speeds of over 270 km/h. Its bends and straight stretches are the natural theatre to show off your driving skills. Perfect for singles, families, groups and incentive events. Puresport has exclusive access to the Monza Racetrack, so get in touch and find out how we can put our professionalism and 10 years of experience to good use when organising and hosting your experience. Monza racetrack is 5,793 metres long and is considered the fastest racetrack in Europe. 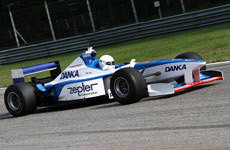 Actually, Formula 1 driver Montoya managed to reach 369 km/h in 2005. Starting from the pit lane, the main straight section is 1,100 metres long. Drive in sixth gear in the Ferrari F430 F1 and you’ll reach 250 km/h – fast! A firm brake and moving down to second gear to enter the first section, made up of sudden right/left turns. After that, back on the throttle, but pay attention not to over-steer especially with the F430 F1. Up to fifth gear to enter Curva Biassono before braking firmly and switching back to second gear to tackle the second variant. In this section, the outstanding traction of the four-wheel drive Lamborghini Gallardo and Porsche 997 Turbo will cast you forward with great force. Third gear and head towards the Prima di Lesmo. Postpone the entrance slightly and drive through the bend towards the right whilst hitting the gas pedal, fourth gear, brake slightly and switch to third gear again to face the Seconda di Lesmo, where you will immediately steer towards the right. Step on the gas for the slight bend to the left called Curva del Serraglio. Then fifth gear until you reach the 200 metre sign and then brake firmly at the end. Shift down to third gear and turn left to enter the famous Variante Ascari, where you immediately shift to fourth gear and have your foot ready to hit the peddle when the track straightens. 950 metres, the second straight stretch, and you are ready to enter the parabolic curve in third gear, shift to fourth and get ready to face the second lap passing on the main straight stretch. «Here I am, in the cockpit of an F302 single-seat - it wraps around me perfectly, everything is in the right place and visibility is excellent. I just need to start the engine and get on the track, in Monza. Monza is a demanding racetrack, especially when you need to identify the braking points after driving on its long straight stretches. Good, let’s go. We are in 6th gear, the engine of my single-seater car is showing its full power. I bear in mind the brake point at the end of the first variante, which is a very sharp turn - a difficult passage even during the start of the F1 GP. I let off the throttle, I very firmly push on the brake and promptly downshift four gears. This sequential gear shift is really fast and “light” to use. I slightly touch the kerb and step on the gas, the engine has a really ridiculous fall of revs on the uphill while it is usually always on a high number of revs,in fact, exiting from the curva di Biassono I am already in 6th gear. 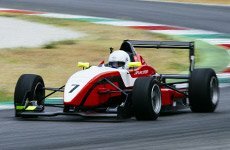 It is incredible how this single-seater car feels the wing: I would be able to drive on the entire Biassono bend without taking my foot off the gas pedal, even if it started to snow! I get to the staccata della Roggia, the jerks during braking do not affect the braking power negatively, so much so that I let off the throttle quite late but I still enter into the bend rather smoothly. I touch the kerb once again - I must remember that, unlike the other Gt cars I race with, I must slightly feel the kerb with this one rather than attack it, otherwise I risk damaging the suspensions. I hit the gas once again and, uphill, I shift to 3rd and 4th gear. Finally Lesmo 1, a bend where this car is really impressive! I brake a little, turn and hit the gas. It’s glued to the road. Its aerodynamics and ridiculous weight make it very fast. The same happens at the curva Lesmo 2, I shift down to third gear since this bend is narrower, yet, I still drive at high speed. I’m careful at the exit, let it go a little- there’s a slight oversteer, but it’s OK. Again, I downshift all the gears in order to arrive to curva Ascari, nice and fast. I let off the throttle, the car decelerates firmly: if I continued to brake with this intensity, I would probably stop before entering the bend, so I regulate the brake and enter in third gear. I immediately hit the gas and switch to 4th in the middle of the right bank, keeping the car close on the chord point. Then, I steer from right to left with crazy reactivity. The single-seater car is there, not moving at all. As soon as I exit the bend, the engine of the Dallara asks for the 5th and then the 6th gear! The straight stretch of the Parabolic Curve does not last for long, I must already brake and downshift 3 gears, I enter the bend and again, I turn the gas on, shift to 4th gear almost at the half of the bend and the stability of the Dallara is, once again, striking. Once again I use the 5th gear very little after exiting the Parabolic Curve, the engine of the single-seater roars and asks me to shift to 6th gear and the speed constantly increases. For special offers and discounts, let them know you are a Puresport customer. 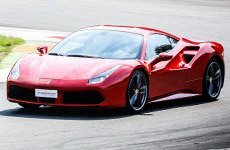 The arrival time at the track will be sent to the client about 10 days before the event; in the same mailing, we also list the documents required to attend the track day for acceptance and signature. If you choose "onboard camera car" service, video will be sent to your email address with a download link around 2 weeks after attending your experience. 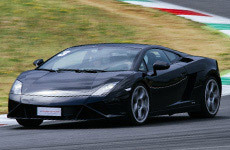 Racing school and sport driving courses on racetracks on single-seater cars, Ferraris, Lamborghinis and Porsches. Original gifts, corporate events and team building. Subscribe to our newsletter and get 5€ discount coupon!